Fresh curry leaves are fabulous…they actually do not have anything to do with “Curry” they are little gorgeous green leaves that enhance your dishes. The leaves are highly valued as seasoning in southern and west-coast Indian cooking, and Sri Lankan cooking, much like bay leaves, and especially in curries, usually fried along with the chopped onion in the first stage of the preparation. They are also used to make thoran, vada, rasam and kadhi. In their fresh form, they have a short shelf life, and they don’t keep well in the refrigerator. They are also available dried, though the aroma is largely inferior. The leaves of these little lovelies, Murraya Koenigii, are also used as a herb in Ayurvedic medicine. Their properties include much value as an anti-diabetic, antioxidant, antimicrobial, anti-inflammatory, hepatoprotective, anti-hypercholesterolemic etc. 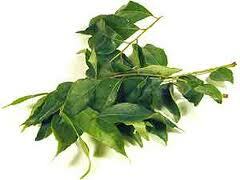 Curry leave also contain iron. They are most excellent if you throw them into hot oil before you begin adding your other ingredients. The flavors are so subtle, they really do bring out other spices in a gorgeous way. A must try if you haven’t yet. This is one of my top favorite sauces that Henry has made for me so far. Secondly, heat a tablespoon of coconut oil, once the oil is hot, add fresh curry leaves, peppers and 1/4 onion, diced. Finally add bison/ground beef, add masala paste, garnish with cilantro and enjoy! We served our with some fresh boiled beets. 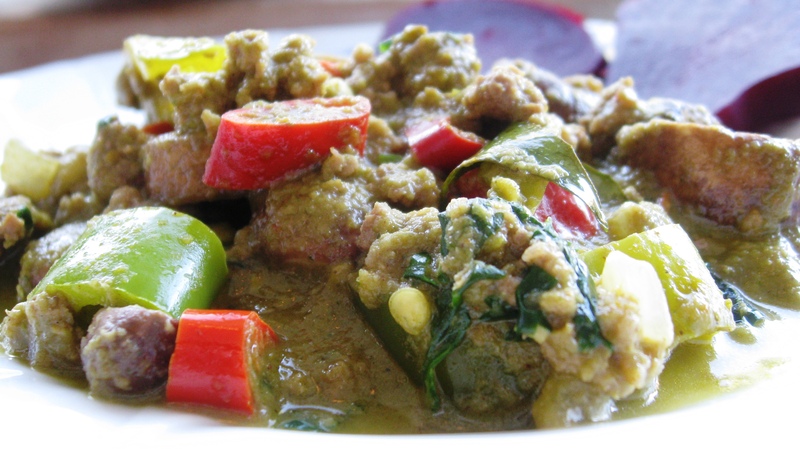 I have 20 lb grassfed ground beef in my freezer and miss my curries… I’ll have to try this!